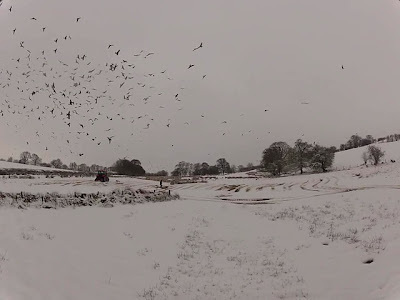 Red kites and snow - again! We have had 4 - 5" of snow but it has also drifted so making things difficult on the farm. Main roads are clear, but our road is very slippery up to the yard. I've added a short movie to our web site to show the shear number of red kites currently feeding.. The clocks will be changing again too. Feeding is at 2pm at present. On Sunday 31st March it will switch to 3pm.